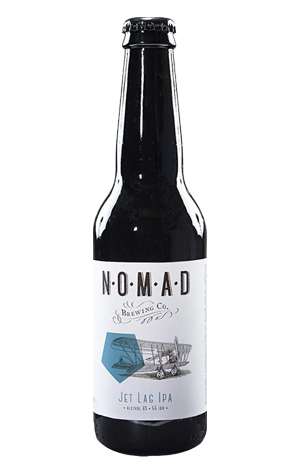 The Nomad Brewing Company has travel in its DNA. It harks back to when Australian husband and wife team Kerrie Abba and Johnny Latta moved to Italy, started their Experience IT beer distribution business and found themselves in the company of Leonardo Di Vincenzo, founder of Birra Del Borgo. After coaxing Leo back to Australia several times to help promote Del Borgo, at some point along the way the idea of a local brewery was raised. That idea became a possibility, then very suddenly a reality. But with all three still living in Italy and travelling widely for their respective other businesses, it took a lot of air miles and transit lounges to get back to Brookvale. The upside is that ideas spring up along the way, such as the Jet Lag IPA. The beer takes some inspiration from the highly-hopped IPAs of the USA (where Leo is a partner in New York's Birreria brewery - the same venue in which Nomad head brewer Brooks Caretta was the former brewmaster) and adds an Aussie twist through the addition of the native bush food, finger limes. It's not a character you'll necessarily pick in the beer outright, but only because you're not meant to. Rather, it's just one of the key components in a much bigger, overall citrus punch from the blend of US and Australian Cascade hops, plus a dash of Vic Secret. Pouring a rich amber colour with a generous fluffy head, this is a highly aromatic brew with strong bitterness – just the sort of sensory hit you need to perk you up after a long flight.